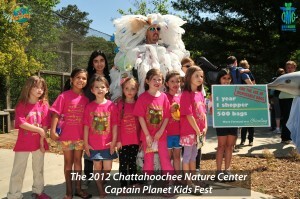 OMG was invited to participate in this years Captain Planet Earth Day Kids Fest which is hosted by the Chattahoochee Nature Center in lovely Roswell GA. 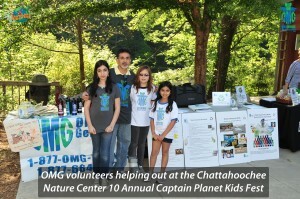 The mission of the Captain Planet Foundation is to give the next generation of environmental stewards an active understanding and love for the natural world in which they live. Their unique program of funding and supporting hands-on environmental projects is designed to encourage innovative initiatives that inspire and empower children and youth around the world as they work individually and collectively creating environmental solutions in their homes, schools and communities. The Mission of the Chattahoochee Nature Center is to provide unique learning experiences focused on the Chattahoochee River that connect people to the natural world and empower them to positively impact their local environments. And as you all know by now, the mission of One More Generation is to preserve endangered species and our environment. Our goal is to ensure all endangered species survive at least One More Generation… and beyond and we aim to make that a reality by educating kids across the country about the need to care for our environment for us, and for all God’s creatures. 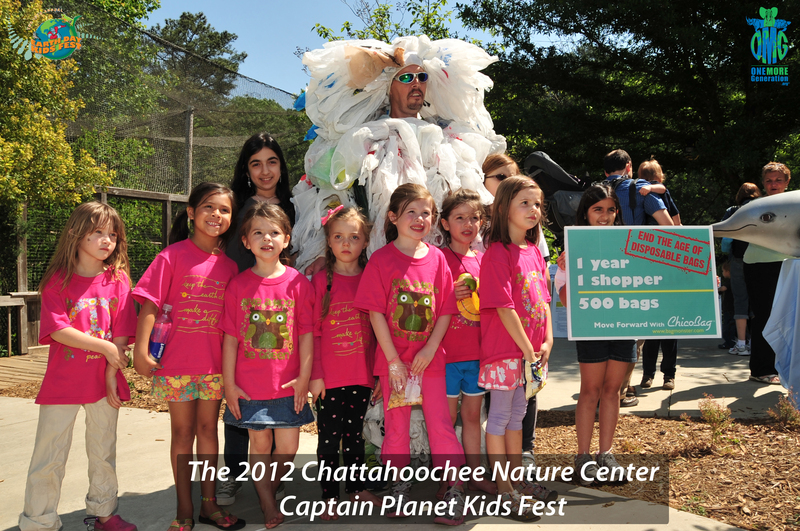 To ensure our success and maximize our reach among students, we are constantly aligning ourselves with like-minded organizations such as Captain Planet and the Chattahoochee Nature Center. 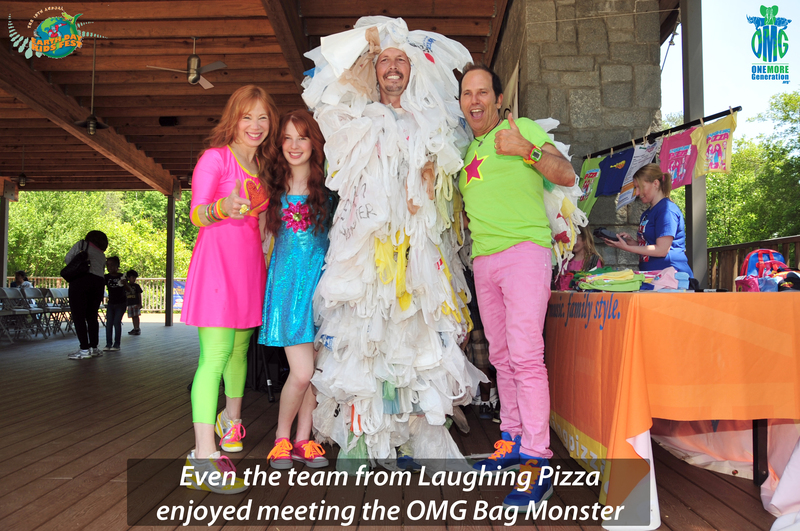 The 10th Annual Earth Day Kids Fest is held at the Chattahoochee Nature Center each year and the event included the ever popular music group Laughing Pizza. Back by popular demand – attendees were able to sing and dance with the award-winning family band, Laughing Pizza. Laughing Pizza is a real family band who write and perform all original pop-music for families. Their music videos can be seen every day in over 18 million homes on PBS stations and TV On-Demand around the country. Olivia loved meeting this great family and we are hopeful that we will have the opportunity to work with them on a future project which will help raise awareness to the issues of plastic pollution to kids across the country. 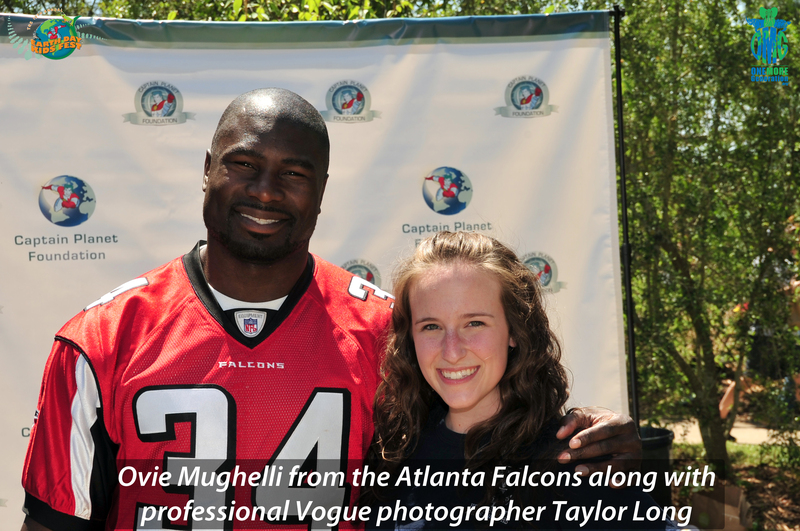 Also at this years event there were plenty of Eco-Heros where attendees were able get an autograph and their photo taken with the Greenest football player in the NFL—Ovie Mughelli. They also had the opportunity to meet the ultimate eco-superhero—Captain Planet and his arch enemy the OMG Bag Monster. The nature center also had Eco-Exploring opportunities where families could paddle a canoe on Beaver Pond, hike their woodland trails, and visit with non-releasable wildlife. The perfect opportunity to be a part of nature! Visitors were able to get moving by joining Paul Tukey, Co-Author of Tag, Toss & Run, and play games from all over the world! Visitors were also greeted by local organizations (such as OMG 😉 that are helping the planet and could find out how they too could get involved! Visitors were treated to fun and exciting hands-on activities especially for kids! Plus found eco-friendly products for the whole family! Visitors were also able to discover their own “Act of Green” by making their own pledge for the planet! Families brought corks, cell phones, ink cartridges and alike to be recycled on the grounds. 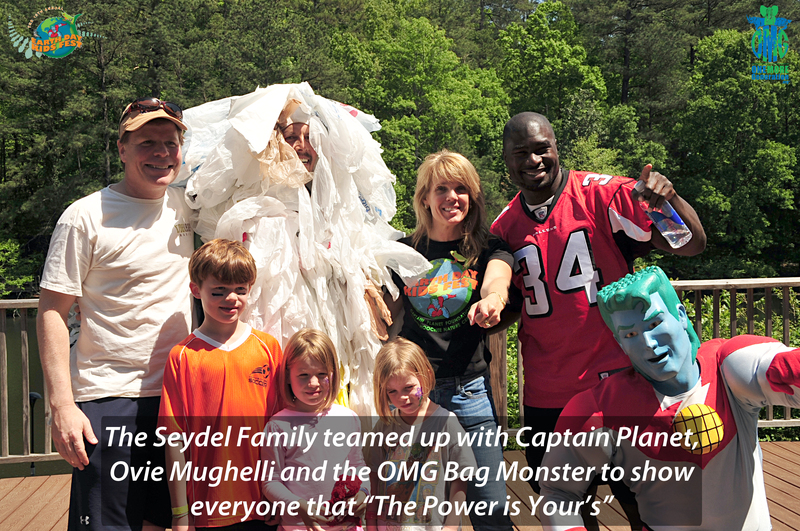 They also had the opportunity to meet the OMG Bag Monster and learn how to avoid becoming one themselves. OMG had several volunteers on hand to help spread the word about our Plastic Awareness Week curriculum program and we were sincerely overwhelmed by the amount of interest from families, students and even teachers and church groups. Our program has been designed by teachers and students to ensure we are providing a fun and fact-filled curriculum that will excite and empower the next generation of eco-warriors. Visitors were greeted to an excellent day of family fun. The weather was perfect and the organizations who participated in the event were all too pleased to want to help families find ways to make a difference in their homes, schools and communities. 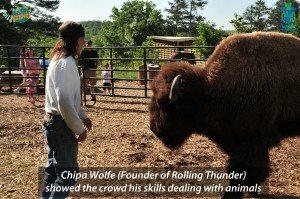 There was even a full grown buffalo on hand named “Thunder” who was brought by the founder of Rolling Thunder Enterprises Chipa Wolfe. Chipa has been producing cultural showcases and entertainment programs for over two decades with rave reviews from the educational institutions, corporations, law enforcement and government leaders and the film industry. Chipa is of both French and Indian decent and his desire to highlight Native culture is amplified by a deeper desire to promote a union between man and earth and his presence helped visitors realize the need for each of us to get involved with what happens to all animals. Here is a complete list of all the great organizations who attended this year: 2012 Eco-Village Participants with links to their respective websites. We encourage everyone to reach out to them all and let them know how you liked this years event. We have also added all the photo’s we took during the event to our FaceBook page and invite everyone to view them here: CNC Earth Day Kids Fest Photo Album If you had your picture taken with the OMG Bag Monster, please browse through all our pictures and feel free to download as many photo’s as you like. 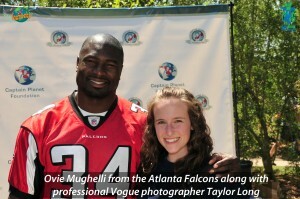 We wish to thank Taylor Long who was one of the energetic volunteers at the Chattahoochee Nature Center for taking the majority of the pictures for OMG during the event. Her photography skills are apparent in every photo as she truly captured the excitement of the visitors throughout the day. 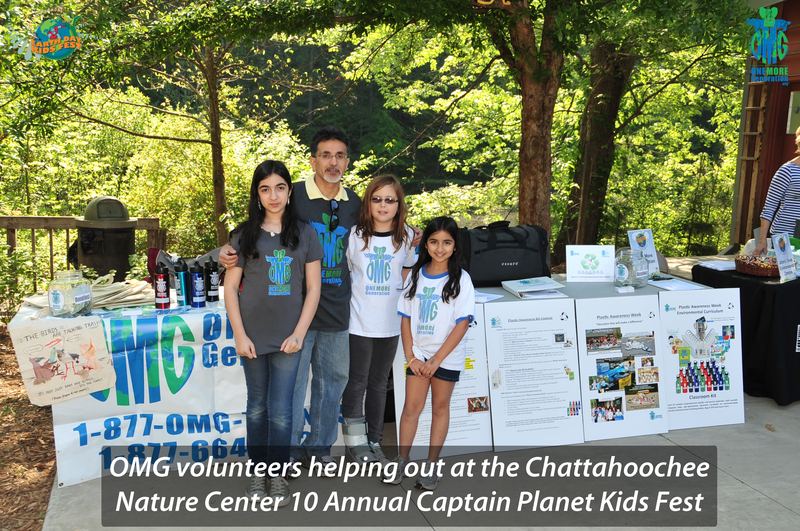 We also wish to thank the entire staff and volunteers at the Chattahoochee Nature Center and from the Captain Planet Foundation for hosting such a successful event. All of us at OMG sincerely enjoyed being part of the event and we look forward to doing so again in the future. If you would like to learn more about our Plastic Awareness Week curriculum program, or about any of the other great initiatives our two young founders are working on, please drop us a line at info@onemoregeneration.org and we will gladly get back in touch with you. You can also contact us about possibly booking us for speaking engagements at your school, business, church or community. If you know of a school which might be interested in learning more about our environmental education programs, please let us know and we will gladly work out the details with them.